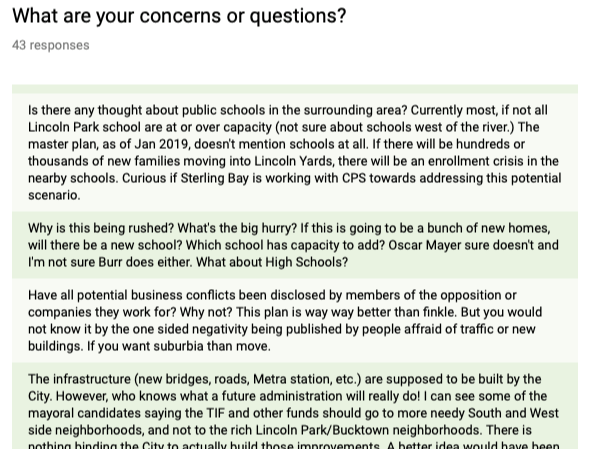 Last week we put out a poll to our SNA members asking about your initial reaction to the revised Lincoln Yards proposal. Thank you to our members and to community for your input. In a very short period of time and with no promotion outside this SNA newsletter we received 51 responses. As stated last week, the primary purpose of the poll was to gauge our SNA community pulse on the topic and also to bring your questions to the meeting we had on Monday with Sterling Bay and Alderman Hopkins. Thank you for those and for your help! The information was sent to Alderman Hopkins office as well. Here is a link to the poll results for those interested in learning what others in the community are thinking and saying. The poll is now closed. Thank you!